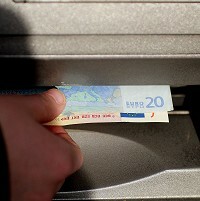 Britons could be incurring unnecessary ATM charges when withdrawing money overseas, a survey has revealed. Travel search site Skyscanner also discovered that there was a huge discrepancy in charges made between banks. It said customers using the same bank while abroad as they would do back in the UK are also being charged different amounts depending on which card is used. The survey also discovered that debit cards tend to incur the highest charges because they operate on a per transaction basis, rather than on the total amount spent. A third of travellers now opt to use a credit or debit card while spending currency abroad. The fact that many Britons might be paying over the odds to withdraw money while overseas has made taking the time to secure the cheapest travel insurance deal all the more important. Carol Petrie, Skyscanner money expert, said: "Our study shows the importance of doing your research before you go on holiday. Consumers should check how much their bank charges and look at using a card where there is no interest rate charged on purchases made abroad, no foreign exchange fee and no ATM cost."